Twenty-seven years ago, I rode a bicycle through southern England, and it was a delight. If I was on the road in the late afternoon, someone would materialize and invite me in for tea (I fear that I might have looked lost). It was an unforgettable first time in Europe. I hope I was well-behaved, and that anyone who invited me in for tea will remember and give our little book a try. 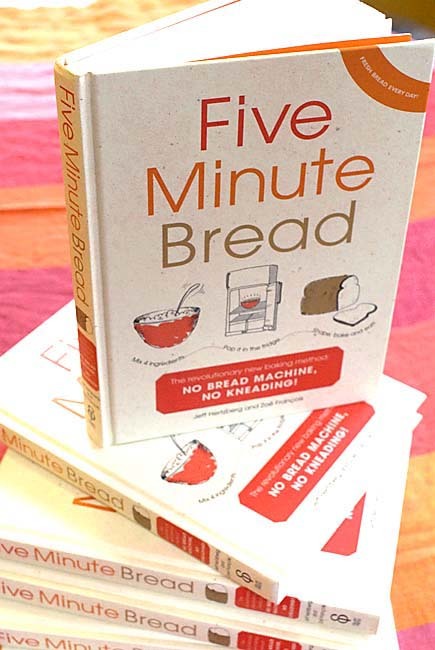 Five Minute Bread has been released in London by Random House/Ebury and is available at Amazon UK, and at booksellers all over England, Scotland, Wales, and Northern Ireland. Britain’s largest daily newspaper, the Telegraph, says we’re number 20 on its top-50 list of ways to feel good this year. If you’re new to our method, this book is based on our best-selling U.S. bread cookbook, Artisan Bread in Five Minutes a Day. Our bread cookbooks are different because we make a large batch and store it in the refrigerator, where it’s ready when you are for quick daily baking (click here for more on our method and a sample recipe– 2 pounds equals 910 grams, by the way). American readers should note that this book isn’t available for sale in the U.S., because U.S. rights to our book belong to Macmillan/Th Dunne Bks (the books aren’t allowed to compete with each other). So, what’s new in our British edition? Well, our Americanisms are pulled out, so now corn=maize, and cornmeal is polenta. And if an ingredient wasn’t likely to be found in the UK, that recipe went away. But most important is the units– we used weights, not U.S. volumes. European home bakers bake by weight, not volume, so the flour, cheese, and vegetable measurements in Five Minute Bread are given in grams and pounds, not cups. Water is given in milliliters and pints. The one thing that won’t change is that we’ll continue to support our readers anywhere in the world, right here (fiveminutebread.com re-directs to this website). Many thanks to our friends at Ebury in London for “translating” our work. Cheers! I have your book and love it already before even starting to bake. I am in the UK and we work in metric – does the basic recipe 6 3 3 13 have a metric conversion? Which book did you buy? let me know and I can try to help you. Will you be selling Five Minute Bread in Australia? We are like the UK in respect to ingredients and their names, and although we use cups and weights (personally I love my digital scales! ), we don’t use imperial measurements (inches, quarts, ounces). Random House UK (Ebury division) isn’t doing a lot of aggressive distribution of the book, so I’m not surprised you’re having trouble finding it in Australia. Have you tried to see if your bookstore will order it? Otherwise the only option will be online, and that might mean high shipping charges. I sourced a copy of the book, and must say I’m very disappointed there’s not a single photograph. Not of the steps for the master recipe (very useful when a first-timer at using the technique), nor of what the finished product should look like. In the American books there are heaps of photos! I feel cheated. If sales are not great for this book, consider this a reason why. Hi, I used to live in the US and have the Americam edition of your book, which I love. Now I’ve moved back home to England, I want to continue baking the bread. Can you tell me what is the English equivalent of all-purpose unbleached flour, and where I would get it from? Thanks. The all-purpose flour for the master recipe is 3 cups (680 grams). I think the flour is sold as Plain Flour.